In the three years since Donald Trump first announced his plans to run for president, the United States seems to become more dramatically polarized and divided with each passing month. There are seemingly irresolvable differences in the beliefs, values, and identities of citizens across the country that too often play out in our legal system in clashes on a range of topics such as the tensions between law enforcement and minority communities. How can we possibly argue for civic aspirations like tolerance, humility, and patience in our current moment? In Confident Pluralism, John D. Inazu analyzes the current state of the country, orients the contemporary United States within its broader history, and explores the ways that Americans can—and must—strive to live together peaceably despite our deeply engrained differences. Pluralism is one of the founding creeds of the United States—yet America’s society and legal system continues to face deep, unsolved structural problems in dealing with differing cultural anxieties and differing viewpoints. Inazu not only argues that it is possible to cohabitate peacefully in this country, but also lays out realistic guidelines for our society and legal system to achieve the new American dream through civic practices that value toleration over protest, humility over defensiveness, and persuasion over coercion. With a new preface that addresses the election of Donald Trump, the decline in civic discourse after the election, the Nazi march in Charlottesville, and more, this new edition of Confident Pluralism is an essential clarion call during one of the most troubled times in US history. Inazu argues for institutions that can work to bring people together as well as political institutions that will defend the unprotected. Confident Pluralism offers a refreshing argument for how the legal system can protect peoples’ personal beliefs and differences and provides a path forward to a healthier future of tolerance, humility, and patience. "The 2016 presidential election, assuming both Clinton and Trump are the nominees, may well be the ugliest and most vicious election many of us will have ever seen. There’s no easy or quick way out of this. It will require some large number of Americans to re-think how we are to engage in politics in this era of rage and polarization. 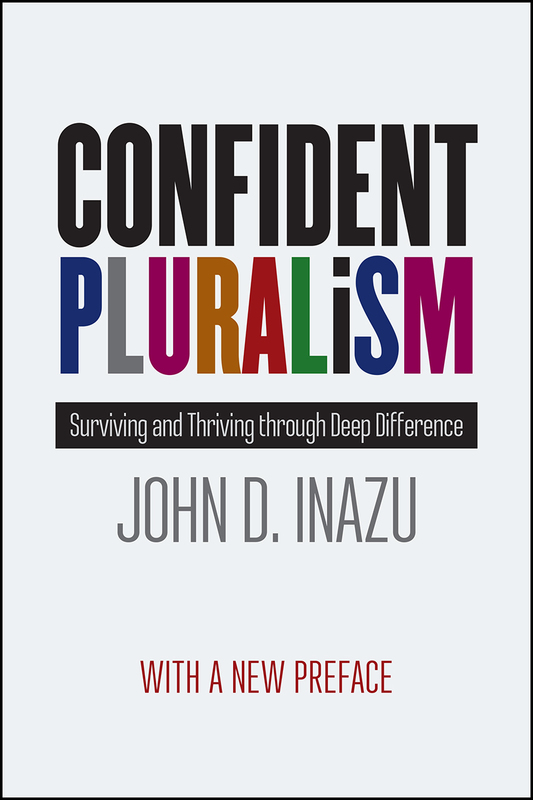 Toward that end, Inazu has written Confident Pluralism. It’s so unfashionable, so unrealistic, so out of touch. It’s chic to be cynical. Except for this: Disagreeing with others, even passionately disagreeing with others, without rhetorically vaporizing them is actually part of what it means to live as citizens in a republic. The choice is co-existence with some degree of mutual respect—or the politics of resentment and disaffection, the politics of hate and de-humanization." "Inazu’s book should be read by all who desire a more civil, thoughtful society than the one in which we find ourselves." "American society is becoming increasingly diverse. As that happens, the public square becomes a crowded, and sometimes hostile, place. At times it seems there is no longer room for meaningful public debate. Inazu sets forth a framework for public square engagement that allows citizens to live according to their convictions while actively participating in a diverse society." "Inazu offers an important new consideration of the value of pluralism for American democratic society. Confident pluralism, Inazu explains, is a political solution to the problem of deep and pervasive differences in the electorate. It recognizes difference and even invites it while acknowledging the need for consensus and unity in political life. The end goal of confident pluralism is not to resolve all issues but to allow individuals to function despite their differences. Highly Recommended." "One of the great virtues of Inazu’s work is that it attends to both culture and institutions. Confident Pluralism both prescribes the kinds of institutional and legal changes that would protect the groups and associations that make genuine pluralism possible, and it describes the habits and inclinations that would make those institutions effective." "It is abundantly clear that we have become a deeply divided country....This country no longer has one clear majority. Inazu explores the ways Americans can live together peaceably despite these deeply ingrained differences." "Inazu has emerged as one of the leading scholars on freedom of association and religious freedom." "This country no longer has one clear majority. Inazu explores the ways Americans can live together peaceably despite these deeply ingrained differences." "We live in divided times—terrifyingly divided times, it sometimes seems....We’ve just concluded one of the ugliest presidential elections in our country’s history, and in a month or so we’ll begin one of the most controversial presidencies, if not the most. How can we navigate a world like this one? [Inazu] wants to offer us a road map of sorts." "Could hardly have been more timely. Confident Pluralism anticipated a presidential election cycle in which partisans on both sides would view not just the candidates, but even the voters who supported them, with nearly unprecedented hostility." "Confident Pluralism deserves to be widely read by academic and lay audiences alike. And as one who upon occasion leads undergraduate book discussion groups, I highly recommend it for that purpose." “Confident Pluralism names the challenge we face as a society that is made stronger by being more diverse and more dynamic, and weaker by being more divided and fragmented at the same time. The answer to that challenge, as Inazu suggests, lies in taking pluralism seriously and framing a political conversation that focuses on our successes rather than dwelling on our failures."